13 parks, all start neutral. 9 landmarks, all start neutral. 2 are also Old Tokyo regions. 86 deployable regions in all, 20 neutral starts, 106 total. Please correct me if I'm wrong and explain why, because my numbers are different from yours! It changes slightly if my numbers are correct, since 6 player games will include 1 bonus per player. Once you've double-checked this I can put it in he first post. Instead of adding more neutrals, I could break up 3-region territories using drops. Last edited by shakeycat on Sat Mar 03, 2012 11:07 pm, edited 14 times in total. I approve. Good work yes! This city definitely deserves a map...I'll take a look back in some days. For now, just throwing out my support. I like the cartoony style - I think the Animé theme could work well (although I'd switch out for a much cleaner, modern font). Stylistically, I don;t know if you're wanting to reflect something like this: http://www.tourism.metro.tokyo.jp/english/welcome/index.html? The style is cartoony? I just thought it was simple. Huh. The font - I'll try something else. Cleaner for sure. Might just use Albertus until I find it, my old standby. Oddly enough, I've never even seen that map before! Even with all the map searching I've been doing over the past few weeks. But yes, that's exactly the idea. I want the map to have a bit of dimension. I wouldn't feel right having a bland, flat map in this case, especially if it's just full of confusing, foreign names. And upon seeing that map .. hmm. I wonder. I forgot about some of these places. And the train lines (even though you didn't mention them) - I have them on another layer - but I didn't think it needed them. It made things too cluttered and didn't really add to gameplay for me. What is the gameplay structure of this? All I see is colorful divisions and a mildly baffling legend. It's a draft. Still working out best way to approach gameplay, as one sees from my rambling initial post. Legend is holding its place. 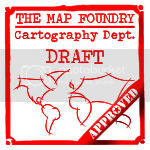 shakeycat wrote: It's a draft. Still working out best way to approach gameplay, as one sees from my rambling initial post. Legend is holding its place. With the various landmarks/parks you could do auto-deploys (of at least 2), collective bonuses (as in, +X for Y landmarks), or assign each landmark/park a category and give a bonus for having landmarks in the same category. I think that a bonus structure similar to the one MrBenn used with England could be the best option. What is your current idea with Parks and landmarks? How they are supposed to work? or are they picked up randomly? Victor, I'm glad to receive suggestions! 1. First I thought the additional +1 for the second region bonus would be good, and certainly something different. But when I counted it up, it came out a little unfairly. Suburbs would get +1 for an average of 3 territories, while Central would get +1 for average 6 territories owned. Old Tokyo was in the middle, 4-5. And the England style bonus, I like it, and it's a clear fit, especially with the three super-regions in both Tokyo and England. But I don't like how easy it is to sweep someone on that map, simply by going first and knocking out one or two territories in strategic points. I'm not sure if parks and landmarks would change the sweeping aspect enough. Maybe the combination of them and the shape of the map would. 2. Parks, I'm cool with an autodeploy. It makes sense, with your armies there to refresh and hide. To have a +2 autodeploy, we'd probably have to start them neutral. What's normal here, neutral 7? Landmarks, the collective bonus seems logical. One would return from Tokyo and have to show to family the photos from all the sites, right? They could be a random drop like Italy, similar bonus structure. Is Italy's drop controlled at all? It feels random, considering how often someone starts with +1 or even +2. With currently 8 landmarks, a bonus starting at +1 for 3 owned could work. The odds are slim that one would get all three in a protected bonus (Imperial Palace, Meiji Shrine, Thunder Gate would be inside a neutral barrier). This is a good start. 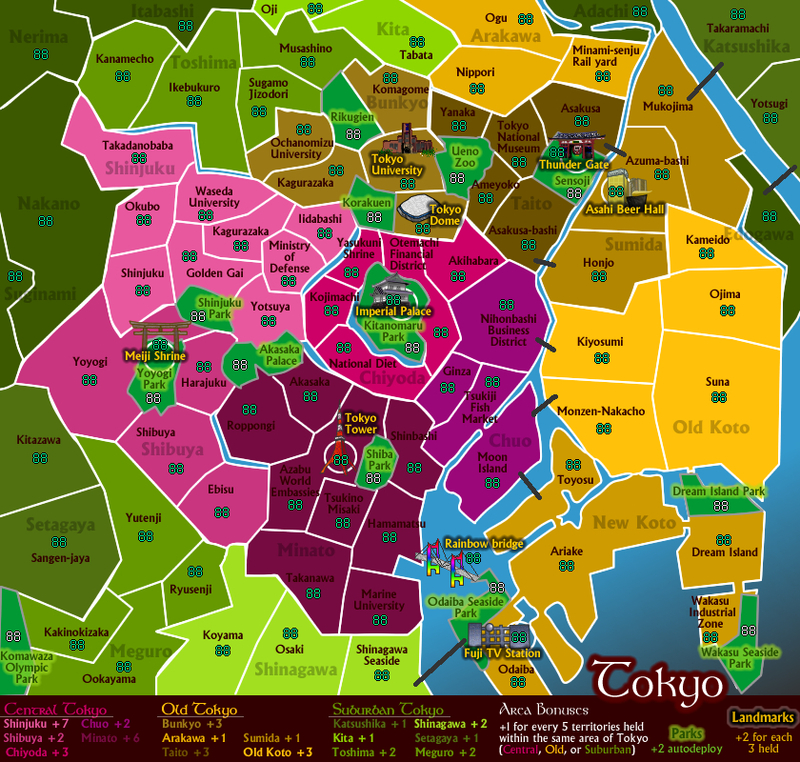 Tokyo defenitely deserves a map. - Roppongi is famous for its copy of the Paris Eiffel tower. - maybe you should incorporate some refenrce to the excellent subway system of Tokyo. shakeycat wrote: Victor, I'm glad to receive suggestions! shakeycat wrote: 2. Parks, I'm cool with an autodeploy. It makes sense, with your armies there to refresh and hide. To have a +2 autodeploy, we'd probably have to start them neutral. What's normal here, neutral 7? With a +2 autodeploy, 3 or 4 neutral is reasonable. No one will go for it otherwise. shakeycat wrote: Landmarks, the collective bonus seems logical. One would return from Tokyo and have to show to family the photos from all the sites, right? They could be a random drop like Italy, similar bonus structure. Is Italy's drop controlled at all? It feels random, considering how often someone starts with +1 or even +2. With currently 8 landmarks, a bonus starting at +1 for 3 owned could work. The odds are slim that one would get all three in a protected bonus (Imperial Palace, Meiji Shrine, Thunder Gate would be inside a neutral barrier). You could even do something along the lines of +1 for 3 and +1 for each additional after three. Makes the landmarks a little more worth it, and it still largely avoids high percentage bonus drops. as far as rails go, at least a few of the lines would be cool, namely the yamanote loop and maybe the chuosen. also, why didn't you include any of western tokyo? areas like chofu may not be included in the 23 wards, but they are still part of tokyo. and if you are trying to stay true to the wards, why are areas like nerima and itabashi unplayable? good work tho! having lived there, i'm really looking forward to playing this map! Yes - it's a typo, and I'll fix it. I left out the west because I didn't see much of interest there. 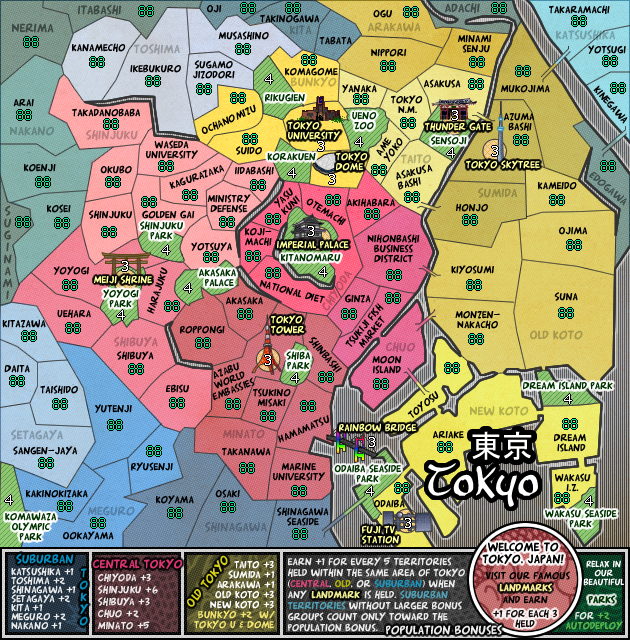 It looks like beyond Central and Old Tokyo, it's just a whole lot of suburbs with unfamiliar names - to the average CC user, who is likely not from Japan and would approach the city as a tourist. 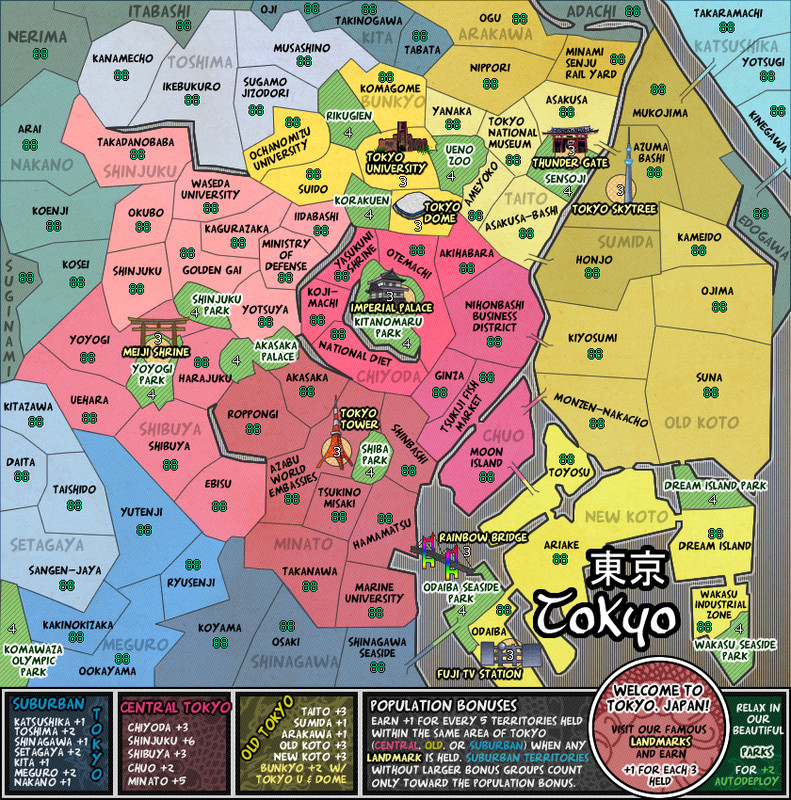 I figured it'd be better to focus on the heart, than to expand the map to a complete accurate portrayal of all of Tokyo, and leave the heart to a few token territories. It's why Ota is missing too - it simply didn't fit once I zoomed in, and didn't seem important. I actually started drawing up Osaka a few years ago, but kept getting caught up in the suburbs and trying to fit more and more in. I had so many train lines heading to Kobe, Kyoto, and Nara, that the loop around that city's heart was tiny and insignificant. Nerima and Itabashi aren't unplayable, I just coloured them grey for now because they perplex me. They should actually be green. I need a bonus scheme that accounts for the grey and green as a single group. Grey was probably a bad colour to choose, in this case. Hopefully I can find some time soon to clear the map up a bit. Still going with this one? Looks nice so far! Not sure how exactly do show that Meiji Shrine, Thunder Gate, Asahi Beer Hall, Imperial Palace, etc. are within the park or territory. Put a circle in as in "this is territory within territory". I think that the icons are big enough where you can fit the numbers right on them. shakeycat wrote: Not sure how exactly do show that Meiji Shrine, Thunder Gate, Asahi Beer Hall, Imperial Palace, etc. are within the park or territory. Put a circle in as in "this is territory within territory". They look like they are in the parks to me. I think I see a little resemblance of your Puget Sound map in this The legend background color needs to be a little lighter I think. The maroon text on the left is a tad hard to read, and will probably not be able to read for our color blind folks.